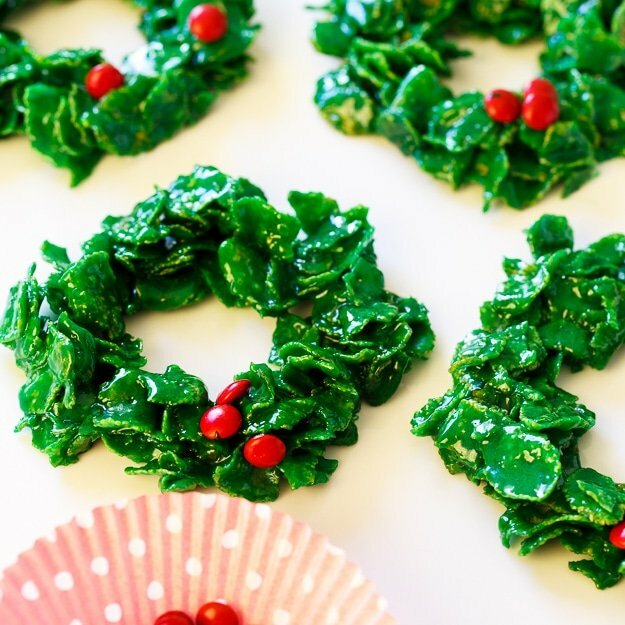 Don’t you remember making these Cornflake Christmas Wreaths as a child? I still sometimes make them and every time I make these cookies, I’m reminded how much I like to eat a bowl of Cornflakes for breakfast. And lunch. And dinner. Isn’t cereal for dinner the best? 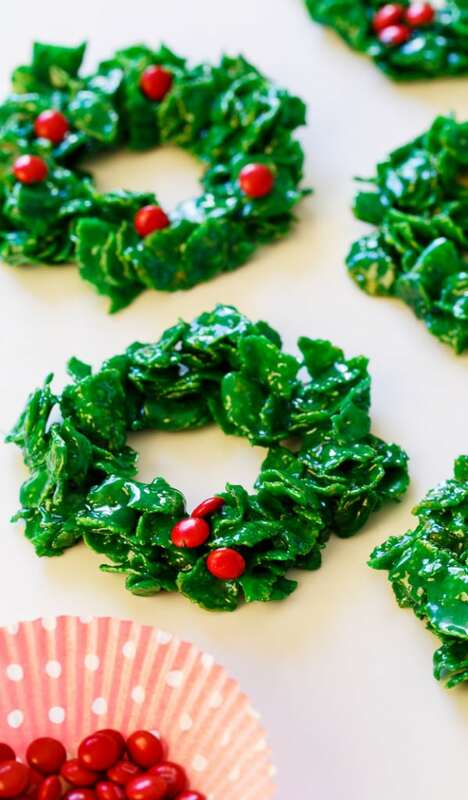 Cornflake Christmas Wreaths take the cake when it comes to festive treats for the holiday cookie tray. With Christmas only 2 days away, you’ve probably about come to the end of your Christmas cookie making. I meant to share this recipe much earlier in the month, but I didn’t expect December to go by with such lightening speed. 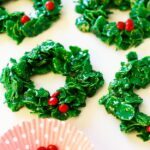 These Christmas treats are so easy to make with just 3 ingredients plus enough green food coloring to give them that perfect evergreen color. I used mini red M&Ms to decorate them with but Red Hots are probably the more traditional candy to use. 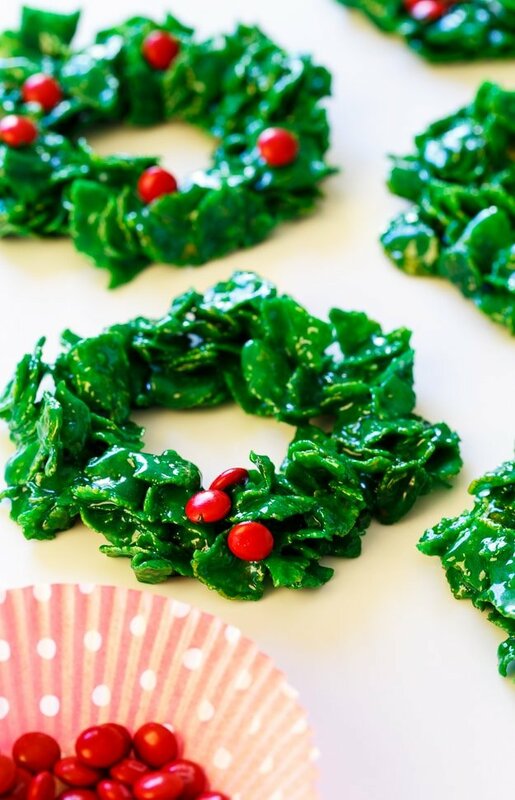 The Cornflake mixture is a little difficult to shape into wreath shapes. I did them free hand but I think it might be easier to use a round cookie or biscuit cutter, spray it well with cooking spray, and dump some cornflake mixture in the middle. Then you can use the end of a wooden spoon to put a hole in the middle. 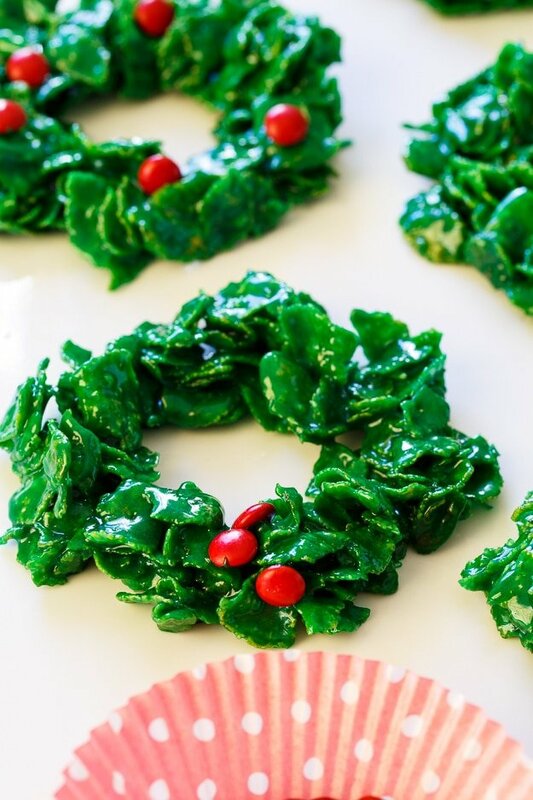 Cornflake Christmas Wreaths are made from only 3 ingredients plus green food coloring. Always a favorite on the Christmas cookie plate. Melt butter in a large pot. Add marshmallows and stir until melted. Working quickly, use a greased 1/4 cup measuring cup to dump the cornflake mixture in mounds on a cookie sheet lined with parchment paper. Use your fingers (grease them well) to form the mounds into wreath shapes. Decorate with red M&Ms before they set. 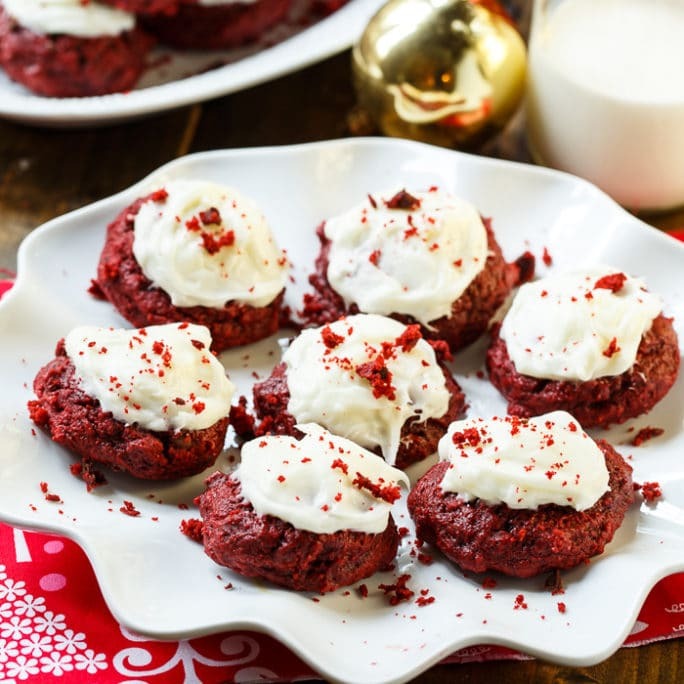 This entry was posted in Cookies, Desserts and tagged Christmas, cookies. Bookmark the permalink. I make large 12″wreaths and large Christmas trees and decorate both with red hots. Much easier and quicker to make this way. I cut into pieces with scissors but leave in the wreath or tree shape. I also chill them. They are delicious chilled. My mom has made these wreaths every Christmas for many years & the grandkids ( who are now in their 20’s – 40’s) look for them every year. It is an on-going conversation when they would gather for the Christmas party — where are Grandma’s wreaths or who found them first!! This year my mom decided to move to an assisted living facility so no more wreaths. Coming across this recipe is bittersweet! And she probably did save it from an Erma Bombeck column. I guess it’s time I start to make them and pass on the tradition!! Thank you so much for sharing this recipe, this was the best Wreath recipe I have ever used. That extra 1/4 cup of butter made the difference when working with them and also the amount of food coloring. One thing I always added to mine is a 1/2 teaspoon or less of Almond Flavoring. They never set up if you make them on a wet day. Pick a nice dry day & let them set on parchment paper until dry. Then store in air tight container. My husband’s family would bring these @ Christmas when our son’s were young; now age 38 & 34. They are such a pretty addition & tradition to our Christmas’. It’s now time to introduce these yummy, pretty Christmas wreaths to our 4 year old grandson. Grandma T.
My family made wreaths every Christmas when i was younger except we added a tsp. Of almond extract…delicious!!! I have made these for years, however, mine never set up. Any idea why they don’t? DO NOT USE VANILLA EXTRACT! If you use vanilla extract they will become soggy, almost stale tasting and won’t set up properly. Thank you Don. Happy Holidays! Finding this recipe is a blessing and a reminder of my grandmother who use to make these for christmas every year. Since she has passed I haven had one of these cookies in quit a few years. So making these so I can share them with my granddaughter and family!! What a great tradition to carry on with your granddaughter! I know she will enjoy them and maybe one day make them for her own grandchildren! I still have the magazine (somewhere) where I first saw this recipe published. They were called Erma Bombeck’s Christmas Wreath cookies. Don’t know where she got the recipe as the article didn’t say but it was way back in the day, probably the late 60’s that I found the recipe. I use to put a few of them on top of all the other Christmas cookies that I use to make and give to friends for the holiday. It was a nice decoration to have on the very top. I have made this cookies almost every year since. They are so addictive. These are so cute and delicious- obsessed! How have I never made these?! They are seriously so cute and festive!! I have made these many times. Make a large wreath and use candied cherries and with the small, I use red hots. Kids loved making and eating them.